This is a unique way to roast a turkey and delicious. It is the traditional slow roasting process from Oaxaca, Mexico. 6 chilies stemmed and seeded. 1. In a 10″ cast-iron skillet over high heat, toast chiles, turning once, until fragrant, about 2 minutes. Transfer to a small bowl and cover with 1 cup boiling water; let soak until soft, 20 minutes. Transfer chiles and their liquid to a blender along with 25 cloves garlic, orange juice, Basil Oil, Fig & Fire Balsamic Reduction, 1 tbsp. salt, and peppercorns and purée until smooth, about 2 minutes. Set chile rub aside. 2. Heat oven to 500° and place rack in bottom third of oven. Season inside of turkey with salt. Rub turkey with chile rub and stuff with onions and oranges; transfer turkey breast side up to a rack set in a roasting pan. Roast for 30 minutes; lower heat to 325° and cook for 30 minutes more. Remove turkey from oven and, using kitchen towels to protect your hands, flip turkey breast side down. Roast, basting occasionally, until an instant-read thermometer inserted into a thigh but not touching the bone registers 165°, about 3 hours total for a 12-lb. turkey. Lower oven to 150°. Transfer turkey, breast side up, to a baking sheet; return to oven to keep warm. Remove turkey from oven 15 minutes before serving. 3. Meanwhile, add port to roasting pan and heat over high heat. Scrape up any brown bits; cook, stirring, until mixture has reduced by half, about 5 minutes. Set a sieve over a bowl; strain liquid and discard solids. Put liquid into freezer and leave for 30 minutes. Skim and discard fat; set liquid aside. Melt butter in a 12″ skillet over medium-high heat. Add remaining garlic; cook until soft, about 2 minutes. Add broth and reserved liquid; boil to reduce by half, about 15 minutes. Whisk in cornstarch mixture; boil; strain through a sieve into a 1-qt. saucepan. Stir in nutmeg and parsley; season gravy with salt and pepper. 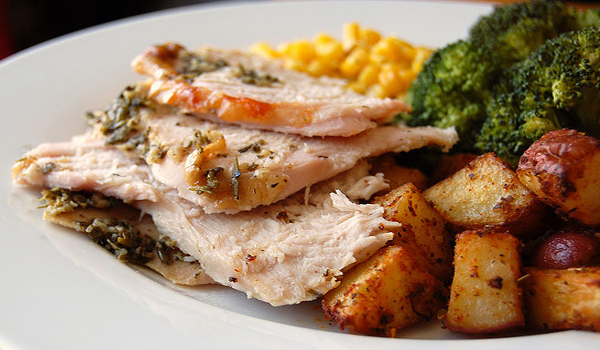 Carve turkey and serve with the gravy. I love sautéed potatoes and corn to accompany this.